Within five minutes of his arrival on April 6, 2018, my mentor, Professor Eric Charry of Wesleyan University, taught me something I did not know about interviewing musicians. Pulling up a photo of Nfamara Badjie playing bougarabou, Eric immediately notices that drum bodies are the traditional bougarabou shape, but the drum heads are not bougarabou. They are djembe, relating to the way in which the drums are tuned. 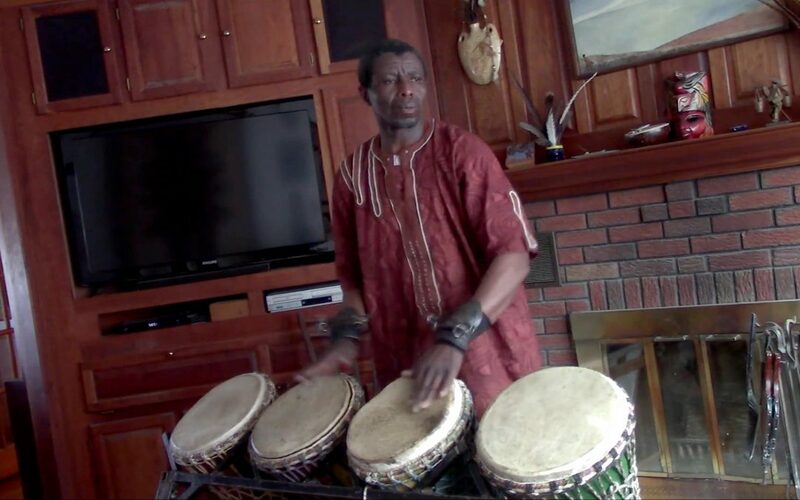 Bougarabou drums are traditionally tuned by heating (putting the drums close to a fire), while the djembe is tuned with a hammer, a more viable system in the United States. I now know to ask how an instrument changes as it moves from one country to another and over time. The difference in drums led to a discussion of the notion of ethnicity tied to a particular instrument. Is the essence of bougarabou and Jola the instrument or the rhythms and songs associated with it? Or a combination? At what point does the instrument change enough to not be bougarabou? Who gets to decide? Eric and Nfamara helped me to place the tradition of bougarabou within the Jola and within the various tribal cultures found in Gambia and Senegal. We also discussed the lineage of bougarabou musicians of which Nfamara is one of the last. Nfamara told us that some Jola believe that he is killing the culture because he is in the United States and not in the Gambia sharing and teaching the bougarabou. Eric reminded me that I need to apply these same questions about changes in instrument or materials, across the genres and not just in music. For information about applying for the Mentoring and Professional Development Program in Folk and Traditional Arts, please contact me at elevy@nyfolklore.org to discuss an application. Like our blog? Complete the form below and receive an email notification whenever a new post is published! Thank you! You have successfully subscribed to the New York Folklore blog.